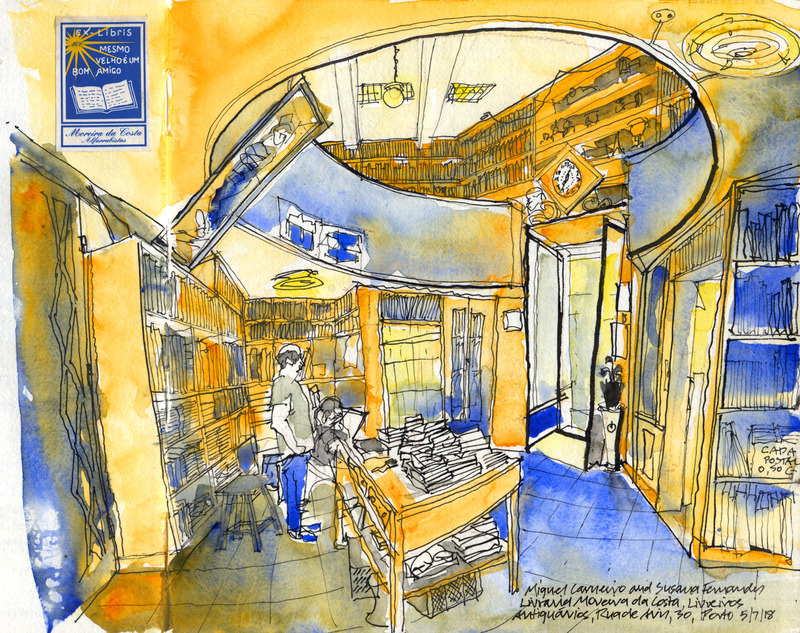 Portugal is a haven for lovers of old books, as well those who like to sketch in shops—I love both. There is a great range of premises and prices, from high-end to street vendors. I’ve been inspired by the excellent series of introductory symposium posts by Paulo Mendes to contribute a specialised footnote if visitors can drag themselves away from scheduled activities. Did I say Portuguese people are friendly? Where better to go first in Porto, than to see Miguel Carneiro and Susana Fernandes at Moreira da Costa at Rua de Avis, 30 (see above). This venerable business founded in 1902 now operates from one of the most unusual shops I can recall, a circle within a square—hard to capture, but worth the effort. Most specialist shops in Portugal open between 10–13 and 15–19 with a sensible break for almoço (lunch) and I was here almost all afternoon sketching and chatting. A short stroll up through Porto’s Santa Catarina district brings us to Manuel Ferreira alfarrabista (a term denoting more than a mere shop, but a dealer in antiquarian books, named after the tenth-century Turkish philosopher Al-Farabi). At Rua Dr Alves da Veiga, 89, Herculano Ferreira and his daughter Mariana tend an amazing specialist business with barely a book to be seen. Mac meets Manueline here. You state your interests and books are produced from an extensive stock. Finally if you find yourself in Lisboa (only three hours from Porto by train or coach), head straight for Baixa-Chiado and stroll down Rua do Alecrim. Here are several bookshops, including my favourite at 40–42, Centro Antiquário do Alecrim, where I always receive um abraço (fond greeting, literally a hug) from Margarida Leite and Cristina Veloso, daughters of the founder Américo F. Marques. A curiosity here is the stock of ephemera, including old liquor labels, from an ancient printing house. Such bookshops are often located in hugely popular tourist areas, but sadly mass tourism in Portugal is bringing unwanted commercial pressures on rents in central business districts. Several bookshops in Rua do Alecrim are scheduled to close at the end of September. It would be a perverse outcome if the very things that make Portugal an attractive destination were the first things to be forced out. Richard Aitken is an urban sketcher, bibliophile, historian, and writer from Melbourne, Australia. 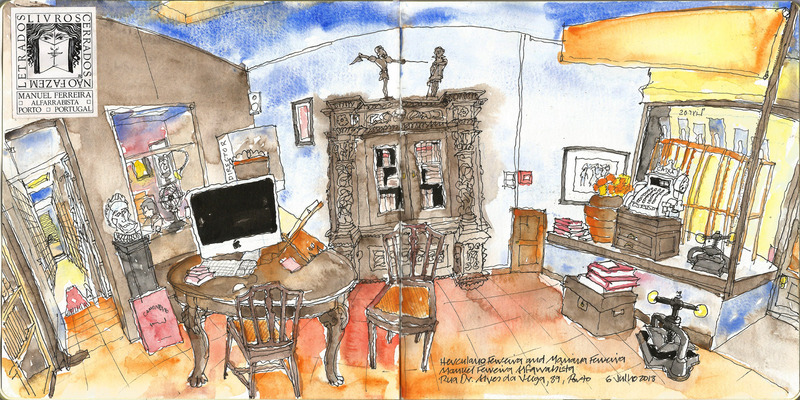 He is currently indulging his passions by attending the 9th international Urban Sketching symposium in Porto. Richard has had three previous guest posts. One of the three, Do buildings have a personality? brings us to two buildings in Portugal.